The School of Audiology and Speech Sciences (SASS) in the Faculty of Medicine at UBC is the only program in British Columbia that educates speech-language pathologists and audiologists. The School offers a Master of Science degree and a Doctor of Philosophy degree. The School gives students a strong theoretical foundation, equipping them with problem-solving abilities that will last throughout their careers. The academic component is enhanced by externships: real-life experience in the field, where students learn and work alongside practitioners. State-of-the-art teaching labs, research, and study areas create an ideal learning space, while the city of Vancouver provides an enjoyable and beautiful locale. The Vancouver region offers a stunning location in which to live while studying at the School. The UBC campus boasts some of the city’s most popular attractions and recreational facilities, including the extensive, forested trails of Pacific Spirit Regional Park. The University of British Columbia (UBC), offers one of the best places in the world to study. Canada’s third largest university, UBC has an international reputation for advanced research and teaching excellence, and ranks strongly among the world’s top 35 Universities. The diverse student body is comprised of approximately 45,000 students. The student population includes a large contingent of international students: 12.6% of UBC students come from 143 foreign countries. 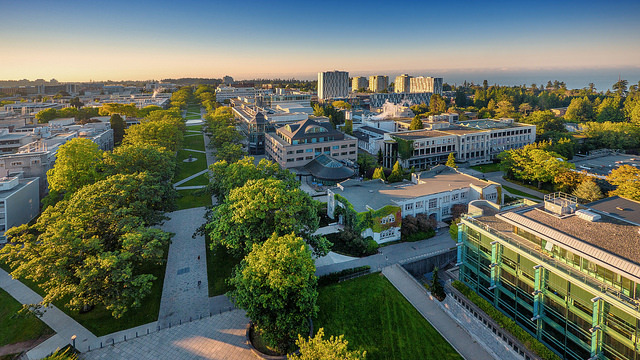 The UBC campus is located in Vancouver, British Columbia — a vibrant multicultural city on Canada’s west coast, renowned for its natural beauty and energetic culture. The University campus is bordered by Pacific Ocean beaches and surrounded by mountains. UBC is home to some of Vancouver’s most popular attractions and recreational facilities, and offers endless opportunities to explore the natural world. Many visit campus to enjoy the forested trails of the adjoining Pacific Spirit Regional Park, to attend concerts at venues, such as the acclaimed Chan Centre, and to visit unique UBC museums and galleries.